This site contains the work of an Anglican Dominican brother. I live and work in San Antonio, Texas, along with my two silly dogs. I belong to the Anglican Order of Preachers, to which I am most grateful. The name of the blog, Domini Canes, derives from an old pun. Members of the Dominican Order were known as “hounds of the Lord”, which in Latin sounds a lot like “Dominican”. The Legal Stuff: Unless otherwise indicated, the thoughts here are my own, with the exception of the images I re-post (in which I claim no ownership interest). I’m so glad you like it, Brother. Peace to you as well. thank you for visiting and “liking” the prayer that I wrote. I am very happy when visiting your site. Love all that I have read and subscribed! I’m so glad you liked the site. God’s great peace to you. Brother James. You are the first member of any clergy to read my blog and actually click the Like button instead of sending me a harshly worded email as to my ignorance. Thank you so much for reading and for being tolerant and kind. Actually, I’m a lay brother, and not clergy. But I think what you said speaks well to all of us who need the occasional reminder that Jesus saved his harshest criticism for those he called “hypocrites.” I know I need that reminder regularly. Thanks for visiting our site and liking our post about pacifism. It’s always nice to get visits, especially from overseas (isn’t it a small world) and to see what other bloggers are writing about. I enjoyed the piece very much. I also enjoy peace very much. I just wanted to thank you for taking the time to read my article on monasticism! It’s always nice to know that someone enjoyed reading what I really enjoyed writing! I’m looking forward to perusing your blog as well. I really loved the piece on monasticism and you are a gifted writer. I look forward to reading more of your work. While I haven’t had time to go deep into your archives, I have spent some time reading recent works, and I am excited to have found your writing. You have been gifted with a great ability to convey the truths of Scripture. Thanks for making these words available. Also, thanks for all the encouragement. You are most welcome, and I thank you for your support as well. I would be interested in knowing more about your own personal journey that led you to become a novice, if you are comfortable with telling it. I may tell that story someday. Thanks for the suggestion. Br. James — thank you for your work. Are you on Facebook? I’d like to talk with you c/ about “The Sacred Pauses”, especially in regards to the saints. Peace to you. Hello Brother James, Thanks for reading my last post and liking it. I added a preface to let people know that I am not bashing anyone’s doctrine, but I see that you already knew that. Thanks for your encouragement and all of your notes. I hope no one thought you were bashing their doctrine. I certainly didn’t take it as such. But I’ve always thought God and his people mattered a lot more than doctrine, anyway. No one so far has thought so, but I thought it would be wise to add a little preface. The point of the piece was to show the damage that believers can do in the name of doctrine. You are right, that people are the most important thing. Thanks for your note! Thank you so much for finding my blog. Have a blessed Holy Week. I hope you have a wonderful Holy Week as well. Great Blog! I am glad there are Anglican Preachers! I too am in San Antonio, what Parish do you worship at? I’m glad you like it. I’m at St. Luke’s. beautiful parish! love the high altar. we are at st. paul’s, you should preach some time? I was just there last week, for evensong. You have a fine parish yourself! I am really enjoying your blog and your insight, brother. I’ve gotten several ideas for sermons from your writtings. Much appreciated! May He continue to bless and keep you. I’m so glad you’ve found it useful. Thank you for the encouragement, and for the blessing. Thank you for the encouragement stopping by My Hmmm Collection and clicking the Like button. With the exception of my Pastor, I believe you are the only member of the clergy who has stopped by for a visit; I am very humbled. Thank you! You’re most welcome, and it was my pleasure to stop by, although actually, I’m a lay brother rather than a member of the clergy. Thank you for stopping by my blog. Glad to have you. Blessings. Thank you, my Brother !! 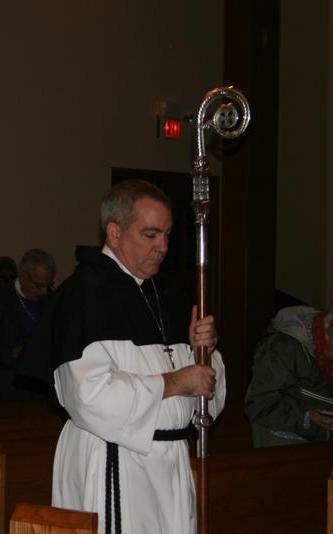 I am an ordained Dominican priest (retired) who, hopefully, will soon be an Anglican Dominican. Blessed Resurrection Day! Austin, O.P.